Spring Colors—— yellow, khaki, light blue, navy, red. This year’s exposed shoulder is classier than last year’s bare midriff. Duly noted. Since we all can’t have a Sandra in our lives (but everyone should), I’m sharing some Sandra-approved spring items in this season’s color pallet. I have to be careful when wearing yellow. If I go too pale, it washes me out so I generally stick closer to more saturated tones like marigold, butterscotch, goldenrod, etc. The richer the better. 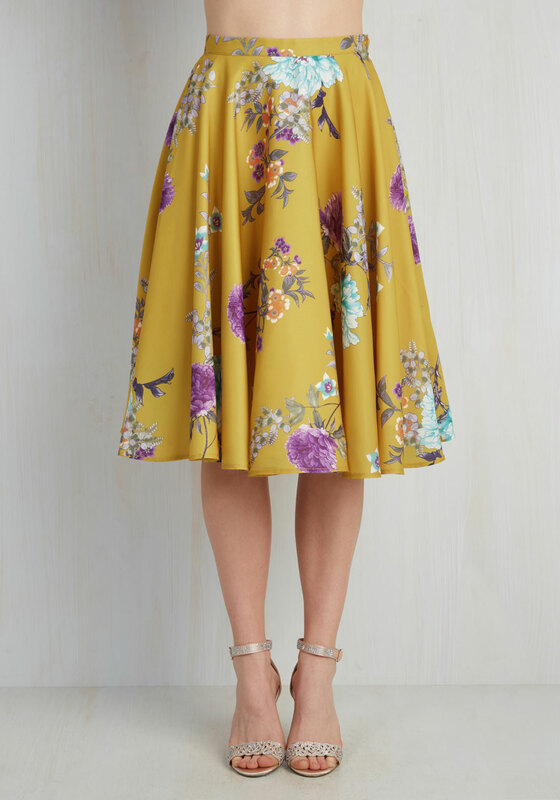 These two skirts have movement and with some cute sandals or cognac ankle boots, you can pull together lovely spring work to happy hour looks. It’s easy to pair these two spring colors without getting too nautical, conservative, or patriotic. Keep the red as the pop of color with the navy item as your base. I have my eye on this eyelet dress from Gap as my navy item for the spring to pair with these red skimmer flats from Madewell. Those flats will also look good with jeans on the weekend and could work throughout the summer into fall. I’m all for multi-season items. Another red item that is on my list is this shirtdress from Anthropologie. One of my favorite shirtdresses was from Anthro and I had to big it adieu some months ago. I love the a-line cut of this as opposed to other shirtdresses that are a little bit straighter. The cut and swing in this dress guarantees some room for the hips, which is always a good thing! Did someone say light blue? As a Carolina girl, I’ve a couple of accessories that rock this hue. In looking for something outside of scarves and shoes, I found this ensemble and I’m here for it. The shorts with the bold pattern (highlighting both navy and red – a 3fer item!) are key and then the mixing of patterns with the top, sold this outfit for me. I’ll be on the lookout for either dupes or ways that I can accomplish this look with my own flair. When I think of Khaki in the spring, I think of the classic trench. My current khaki trench is not Portland friendly, meaning there’s no hood so I’m on the lookout for one with an attached hood to keep the do done on my way to work. This one looks like it will do the job and really you can’t go wrong with London Fog. That’s your spring color report. Consider yourselves updated with the latest per Sandra. What spring colors are you excited about rocking now that the sun is back out? I currently own the London Fog hooded trench coat – love, love LOVE it! It is also machine washable (but can also dry clean), which is great. That so good to know! It’s about to get so much time this spring.